The following is an excerpt from the Singapore Democrats. The SDP expressed its concern that the sale of the market to Sheng Shiong will increase the cost of operating the facility, thereby increasing prices for shoppers. Even though the HDB has said that the wet market will not be converted into a supermarket, concerns remain that the takeover by Sheng Shiong will cause the stallholders to become lessees of the new landlord. The new owner might also implement plans to do away with indivdual vendors in which case the current stallholders will all lose their livelihoods. The vendors will then have to seek employment from Sheng Shiong and they will, like everything else in Singapore, have to compete with foreign workers for meagre wages. There is also no guarantee that Sheng Shiong will not increase the rental of the stalls. In fact there is every likelihood that, being a private enterprise, the supermarket chain will look to maximise its profits to justify its investment. For these reasons, the SDP opposes the privatisation of the wet markets. Unless Sheng Shiong can guarantee that its operations will not lead to any increase in prices for shoppers, the premises should not and must not privatised. HDB would like to respond to media queries on the proposed conversion of some wet markets to supermarkets in HDB estates. We received an application from Heeton Holdings on 2 October 2009 to sell the five markets in Choa Chu Kang Street 62, Choa Chu Kang Avenue 1, Serangoon Avenue 3, Bukit Batok West Avenue 8 and Fajar Road. In the application, the buyer Sheng Siong Property Pte Ltd stated the proposed use of the premises as “wet market”. On 9 Oct 09, HDB met representatives from Heeton Holdings Ltd and Sheng Siong Property Pte Ltd to seek clarification on the use of the five wet markets after the sale. At the meeting, Sheng Siong Property Pte Ltd said that they were aware that they were buying the 5 properties as wet markets. Sheng Siong also confirmed that they will operate the five properties as wet markets. HDB would like to clarify that we assess requests for conversion of wet markets (operated by single operators) to supermarkets on a case-by-case basis. A key consideration is the marketing needs of the residents. We will consider the demand for the existing wet market in terms of the stall occupancy rate, operating hours and customer crowd etc. HDB has informed Sheng Siong that these five markets, as well as another wet market at Elias Mall where Sheng Siong is reported to be buying, do not meet these criteria for conversion to supermarkets. 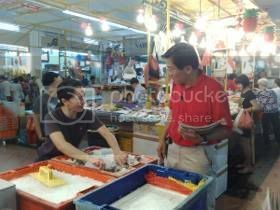 For the wet market at Sembawang Mart, the market operator has submitted a proposal to assign the premises. HDB is evaluating the proposal. We have arranged to meet the existing tenant and the proposed assignee to understand their proposed use for the premises. Similarly, marketing needs of the residents will be a key consideration. HDB would like to remind the existing wet market operators in HDB premises that they must seek the relevant approvals for any sale/assignment and change of use of the wet markets.